Paul: Hello, everyone. This is Paul Parisi with the Edge of Innovation podcast, and we’re here today with Amanda Greaves of Amanda Greaves and Company. So not the whole company here, just Amanda. Are you a figurehead or do you actually do work? Paul: You do? So you’re both a fig— that’s a good answer. So what does Amanda Greaves and Company do? Amanda: We are an interior design firm, and we are all of two and a half strong. Paul: What do you mean half? Amanda: We have a small dog named Daisy. And that is my associate’s dog. But we do interior design for residential, hospitality, and commercial projects. Paul: Okay. And how long have you been doing that as Amanda Greaves and Company? Amanda: As my company, I started it. Yeah. I started my company in 2010, but I’ve been practicing design since about 2002. Paul: Okay. We have a pretty eclectic group of people who listen from very technical people to just ordinary persons off the street. Or strange people too, I’m sure,and unordinary. Whatever. So you do interior design. Does that mean you come to my house and tell me what curtains I need to pick? Paul: Okay. So there’s a differentiation here. Amanda: There is. Decorators are, by any stretch, they are just as important as everybody else on the team, but from a decorating perspective, you’re talking more about the furniture and the pillows and the window treatments and such. From a design perspective, I prefer to get in at the early stages of the planning stages and, with the education and the experience and the certification that we have as designers, specifically, we have the ability to — not physically but on paper — move walls and create plans and create lighting layouts. And we select a lot of the hard finishes. So for us, I look at design from how we do it, is everything that’s physically connected to the interior of a building, if you were to pick it up and shake it, everything that falls out, such as chairs and accessories and stuff, that’s more on the decorating end. And for me, the design aspect is everything that’s still physically attached. Paul: Okay. Now how does that…? We just recently interviewed Ben Nutter. Amanda: He’s an architect out of Topsfield. Paul: Yeah. How does that mesh with what an architect does? Amanda: So architects are more inclined to deal with the entire structure itself. So they do a lot of the exterior. They deal with foundations, you know, a lot more of the code aspects for clearances and references. They deal more with the town when they do for permitting. Paul: Yeah. Ben covered that and talked about that. Amanda: Yeah. So there are a lot of occasions where architectural firms and design firms, where their services overlap. So there are some architects that just create the vanilla box, if you will. So they will make sure that you have your subfloor, your walls are up. There’s plaster on the wall, and you have a ceiling above you. And then the designer comes in and adds everything else. Paul: Really? You mean, so the wall, the floor coverings…? Amanda: Yep. So we would add the hardwood flooring, all of the trim. So your baseboard, your crown moldings, whether you’re carpeting, the paint colors on the wall, all of that. But there’s a lot of architects that like to take it even further, and they will do the majority of the hardscape that’s physically attached and leave things like the fixtures — such as plumbing, lighting, decorative accessories — to the designer. Paul: So it sounds like it’s very collaborative. Amanda: It needs to be. It needs to be, because if I as a designer have a vision for, let’s just say, a living room, and I want a grand piece of artwork over the fireplace, and the architect coordinates with the HVAC guy to put some sort of a ducting right above the fireplace, that’s not going to work with my art. Paul: Okay. So now as we get into this, I’m thinking about…we’ve already talked about design versus decorating and the ordinary person on the street understands that now, but probably wouldn’t have 10 minutes ago. It wouldn’t have been as stark as it is, maybe, to you because you work on it every day. So how do you deal with…You must work with the client, the ultimate user of the facility or the room, or whatever it is. How do you deal with their taste? I mean, because do you get to know them or do you look at what they like? It just seems like a tremendous… It’s like, how do you pick a dress for somebody? How do you pick a shirt for somebody? Amanda: Yep. So one of the benefits that I find be working as an interior designer, the people that are fortunate enough to hire us — whether it’s in a residential aspect or a lot of commercial buildings, the clients that have hired us are more focused on their business, and they just want to make sure that where they’re working is aesthetically pleasing, and they just show up, and it’s all done, and it’s great. In order to understand the taste of a client, we have a lot of checklists. 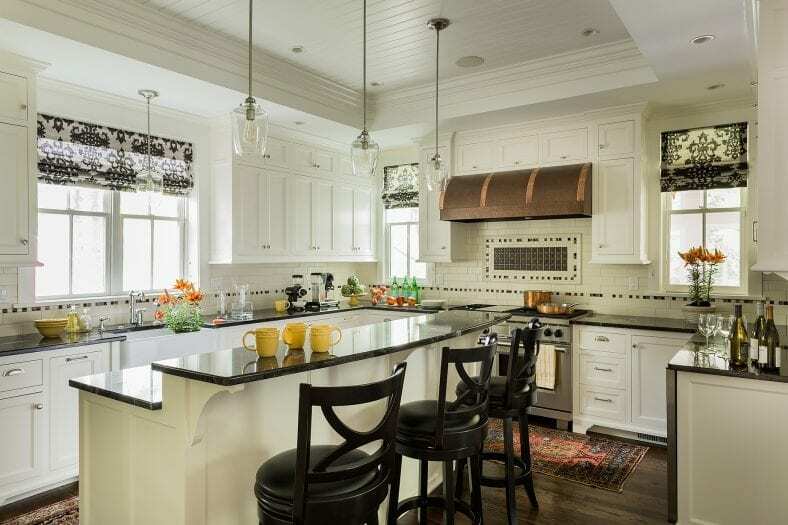 So, lots of times, clients will come to me with an idea, and they’ll say, “I’m traditional,” “I’m very contemporary,” “I’m eclectic,” “I have no idea,” or, “I think I like Shaker style houses,” but what they’re really referring could be Craftsman style. So for me as a designer, my initial job is to do a little bit of a psychological understanding. Who are you? How quickly can you make decisions? Is it you, or is it you and your partner? Is it you and your family? Are there multiple investors involved in the project looking at it from a commercial or a hospitality standpoint? So the answers to those questions start to create the scope of how large the rooms need to be, the style that we’re looking for. We worked with one commercial client, and he was a bit of a Renaissance man, and his concept was more contemporary and streamlines, but he wanted to have the softer aspects of it. So we did a typical cubical, but it had a wood cap on the top instead of doing it like you would assume an office building would be like. And we added some rustic accents for furniture and such in the larger areas. Paul: And then, so you did this. You delivered it. What did he say? Paul: So, was he able to identify the little subtleties that you added in, or did it just work for him? Amanda: For him specifically, I was actually — oddly enough that I used him as an example — he came to me, and he said, “Amanda, if I had been able to do this myself, I couldn’t have done it better,” which for me, was one of the best compliments I’ve ever gotten. Not every client says that. Not every project goes smoothly in the sense of you think you know someone when it gets started, and then when you really get into it three months, four months, 12 months down the line, there’s, “Oh, I forgot to tell you this.” Or, “Oh, by the way, this is what we’re doing, and the scope my change.” I’m fortunate when some clients have the ability to see what I see beyond me having to put it on paper. Paul: You mean “see,” understand what your vision is. Paul: That’s a pretty big color to rule out. Amanda: It’s a pretty big color and I had to figure out the reasons why, and was it a specific blue. Is it teal that he thinks is blue? Is he colorblind? Does he just not like the feeling because it was in his grandmother’s house or something like that? And so I have to dig. I have to dig to be able to find the answers. Paul: Was that as easy as saying, “Well, why?” Did you ask him that blunt a question? Paul: Yeah. And what did he say? Amanda: And then that goes into…I have a minor in psychology. Paul: Okay. I was going to ask that. So when you do this sort of psychoanalysis, do they have… Do you have a couch? Do they lay down? Amanda: There are times where I wish I was laying on the coach asking the questions. Paul: Or is it just sort of part of your understanding of the interaction? Or do you actually have a checklist that you might go on? You know, go in the back room and check out. Okay, he’s crazy. He doesn’t like blue. So how formal is it? I mean, it might be, in your mind, very formal, but I might never perceive it if I’m sitting down with you. Amanda: When I started my business seven years ago, I created every checklist under the sun because, as an entrepreneur, I wanted to make sure that if I was doing this, I was doing it right. And I started my business plan in 2009, and it’s still not done. Amanda: But the checklists, I have them. I think I used them within the first six months. When I have new employees come and work with me, I have them look them over so they understand why. Paul: It’s probably internalized by now for you. Amanda: By now, it’s more just… My name is on that door, and so the representation of myself is who I am as a person. So my ability to communicate with your clients, whether they’re new or potentially new or I’ve had them for three or four years, is creating that dialog where we can understand each other. And that, for me, is more important than figuring out exactly what they want from the first meeting. Paul: Right. Of course, because you want to be able to have something that’s durable, which is that relationship. Paul: So did you specifically get a minor in psychology because you knew you’d be being this? Paul: So that seems very, very exciting or serendipitous. Amanda: It’s very serendipitous. I actually just spoke at Endicott on sometime last week to one of their graduate classes. And there were half a dozen students that are in career changing mode. One was an English major with a business minor. There was a stay-at-home mom that had studied design 15 years ago. There was a woman coming from advertising. There was another woman with a psychology minor, and there was another one who was actually a designer, interior designer minor, and she just carried through to the graduate class. And all of those fields in life are very important for the interior design aspect. So I was able to speak to every one of them individually as I was talking about the overall encompassing facts of my business. So having the psychology minor was more, “Hey, I think I’m interested in this.” And I didn’t realize the value of it until I really started working in the industry back in 2002. But not until I genuinely started by own business did I really see the value of it. Paul: Well it sounds like there’s a lot of things, certainly in interior design that are subject to interpretation. It’s not like, did you move the bricks from point A to point B? No, I mean, it’s not quantifiable like that. So that’s fascinating. I think that all our listeners could take a good notion there, that you need to think about psychology in anything you do. I mean, I really… It’s obvious once you say it. But, you need to be deliberate about that. Amanda: Well, there are still some checklists that I use, and it is a matter of, for example, if we’re doing a master bathroom, there are certain questions I need to ask my clients. One of the first ones, which sometimes get interpreted a little strangely, but, “What do you do in here?” You know, if somebody comes to me and says, “I want to redesign my master suite,” okay great. “What do you guys do in here? What’s the purpose of this room?” It could very well be they have three kids and two dogs, and on Saturday mornings, this is where cartoons happen, and they want to be able to have hot chocolate and a Keurig without having to go downstairs, and they want a fireplace because this is where they spend all of their family time. Or it could be the complete opposite. It’s a very hardworking couple. And they value their time and their private spaces to do what they do. So asking those types of questions, you get to know people very quickly as to who they are and how they live their lives. But the checklists specifically are, we need to talk about plumbing fixtures, tiles, light fixtures. Paul: I see. Reminders of the litany. Amanda: Which creates the scope of what we need to do. Paul: So have you, in asking these questions, have you ever met resistance or friction with people? Amanda: Yes. And usually, if that happens within our initial meeting — because I don’t charge for initial meetings because it’s more me asking question after question. Let me figure out how you are. If I meet with resistance, and if the chemistry isn’t there between myself and a potential new client, we assess the situation. We understand whether they will be good for us just as much as we could potentially be good for them. And in situations where I have felt that it wasn’t going to be a good fit, I will refer them to another designer or another firm.